Portable, easy to use GTD application. Is there a better alternative to iSTK? Is iSTK really the best app in Personal Info Managers category? Will iSTK work good on macOS 10.13.4? 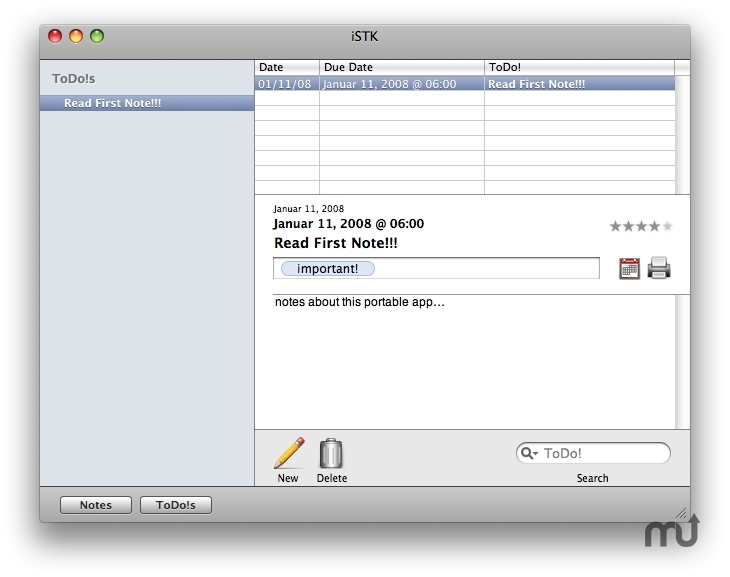 iSTK is a small and easy to use GTD-application. That's nothing new, of course. But iSTK runs from any USB stick, any external HD or even from a Net drive. So you can have all your notes and todo lists with you. Any time and any place. You don't have to manage different list on different Macs, you can even store your notes without the privileges to install applications on your working Mac. Version 1.2: Major Update (specifics not posted by dev). iSTK needs a rating. Be the first to rate this app and get the discussion started!